It's 23:00 in Nuremberg, Germany right now. Frauentorturm A splendid HD view from the Le Meridien Grand Hotel Nuremberg. Nuremberg: PANOMAX Nürnberg Fernsehturm, 0 miles away. 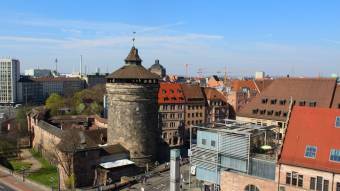 Nuremberg: View over Nuremberg, 0 miles away. Nuremberg: Weathercam, 0 miles away. Nuremberg: Pfarrkirche St. Elisabeth, 0 miles away. Nuremberg: Skycam, 0 miles away. Nuremberg: Nuremberg Airport, 0 miles away. Nuremberg: Nuremberg Old Town, 0 miles away. Feucht: View over Feucht, 8 miles away.